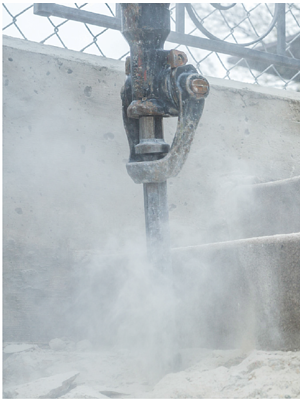 What is Respirable Crystalline Silica? RCS is a form of quartz known as respirable crystalline silica (RCS), a substance found in bricks, clay, concrete, mortar, rock, stone, and many other materials common to construction sites. Why is RCS harmful? When RCS is airborne, it can be inhaled and can embed in the lungs of unprotected workers. This occupational exposure can cause serious health issues or death from conditions such as lung cancer, chronic obstructive pulmonary disease (COPD), kidney disease or silicosis. Where are workers exposed to RCS? Exposure occurs during many different construction activities. The most severe exposures have occurred during abrasive blasting with sand to remove paint and rust from bridges, tanks, concrete structures, and other surfaces. Other construction activities that may result in severe exposure include: jack hammering, rock/well drilling, concrete mixing, concrete drilling, brick and concrete block cutting and sawing, tuck pointing and tunneling operations. A dedicated helper holds a water hose with a nozzle, spraying water at the point of contact between the jackhammer tip and work object. Parker Series 7084 Twinhammer™ Chemically Bonded Air/Water Jackhammer Hose Assemblies are engineered as an integral component of an OSHA-compliant silica dust suppression system. 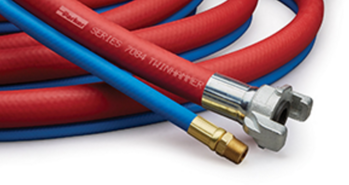 Twinhammer™ hose dual air and water lines are a stable, unitized construction that allows adjustment to fit your application's needs for easy attachment to air and water sources. 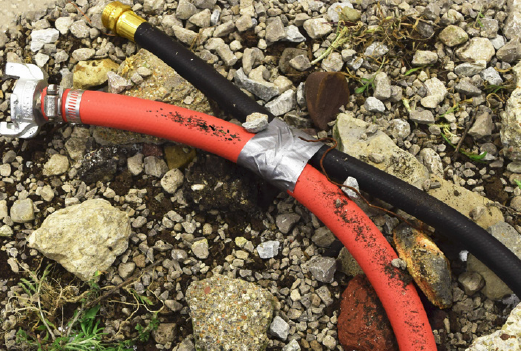 The adjustment also provides easy attachment to retrofitted jackhammers on the other end of the hose. Twinhammer™ hose uses a precisely fabricated hose assembly system that incorporates maintenance-free permanent crimped fittings, bonded lines for efficient and effective installation, and kink-resistant handling that easily negotiates debris and impediments. Parker Twinhammer Chemically Bonded Air/Water Jackhammer Hose Assemblies are easy to route. 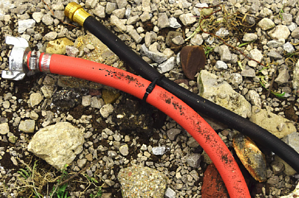 Use to supply air to compressed air powered equipment like jackhammers, and to water supply. Use an adjustable nozzle to regulate water flow to the operation site. * Refer to OSHA's Final Rule to Protect Workers from Exposure to Respirable Crystalline Silica. For additional information visit OSHA's website and Code of Federal Regulations (CFR).